A battered wooden fishing vessel containing eight partially skeletonized bodies washed ashore in northern Japan over the weekend. Disturbingly, it’s just the latest in a string of similar “ghost ships” that seem to be coming from North Korea. At the moment, it’s unclear how long the boat had been floating in the Sea of Japan before it was found, but it can take only a few weeks for bodies to fully turn into skeletons in warm, humid environments. But this ship of cadavers is just the latest in an alarming trend. According to The Japan Times, 11 bodies believed to have come from Korea were found along Japan’s coast last year. In 2015, it was 27. In addition, Sky News reports that 44 seemingly Korean vessels have washed ashore or been spotted off the coast of Japan this year. Since North Korea started facing famines in the 1990s, about 30,000 citizens have defected from the country. But many of these “ghost ships” seem to be carrying dead fishers who intended to return to North Korea. Seo Yu-Suk, a researcher at Seoul’s North Korean Studies Institution told Sky News that as the United States has put stronger sanctions upon the nation, North Koreans are pressured to travel farther away from shore for longer periods of time in order to gather more fish. 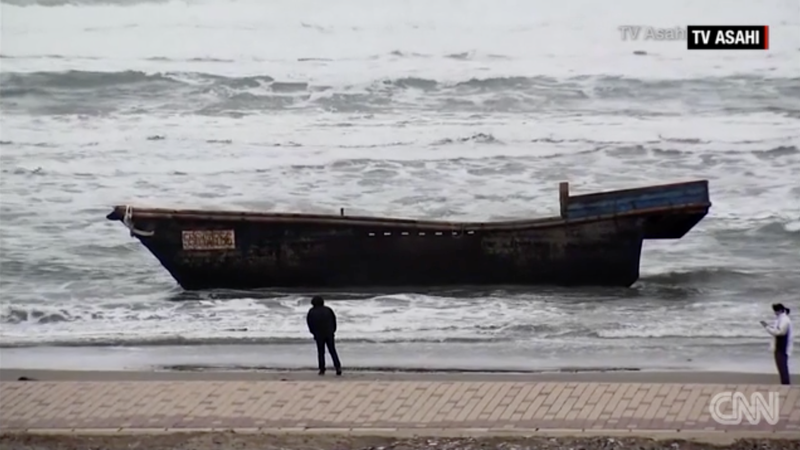 Last Thursday, another boat carrying eight men washed ashore in the Akita Prefecture. Those men, however, were alive and told authorities they were fishing for squid and planned on returning to North Korea.